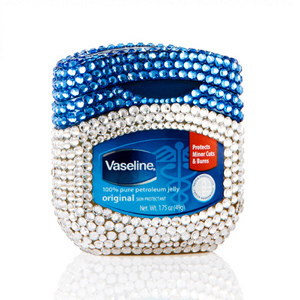 Sparkle and Shine: Va Va Vaseline....? All hail the vaseline! Ok I know kinda random. Vaseline used to make me think of like grandmas and moth balls and other stuff you use when your old. However after an unfortunate incident on Valentines last year where my lips peeled off, I have learned the greatness of what is 100% white petroleum jelly. Vaseline has billions of uses but it has several that are beauty specific. I carry Vaseline around with AT ALL TIMES. There is literally a container in every room of my apartment. You might say I'm addicted. You too will be addicted after you read on and find out all the cool uses for Vaseline. 1) Lip balm. As I mentioned earlier I had a little reaction last year and the skin on my lips honestly peeled all the way off. It was not a good day. One of the things I learned when I went to the doctor was that the only thing you should really be putting on your lips is Vaseline. Apparently chapsticks and lipbalms, especially the ones that are medicated, have chemicals in them that can actually irritate your lips instead of making them better. Now does this mean that I no longer cute balms and glosses....HECK NO! I simply use Vaseline as a base and I know my lips will be fine. 2) Lash Growth. If you put Vaseline on your lashes before you go to bed each night they will seem longer and darker. I am not exactly sure why this is, but I speculate that is has something to do with keeping your eyelids protected and hydrated. For whatever reason, it works and it is waaaay cheaper than those potions you can buy in the stores. 3) Prevent blisters. Got a cute new pair of shoes but your dreading the blisters? Well kiss that worry goodbye! Just rub in thin layer of Vaseline on the spots you think will get blisters and the Vaseline will protect your feet from blisters. Seriously this is like a miracle. 4) Get rid of ugly feet. Before you go to bed, liberally lather on Vaseline to your feet and then throw some socks on. When you wake up in the morning your feet are smoother and softer and just better all around. 5) Lipstick stays off your teeth. If you are going on a date or something and you just put on fresh lipstick, put a very small amount of Vaseline on your front few teeth and it will keep you from getting those embarrassing lipstick smudges on your teeth. The Vaseline will eventually wear off and you cant taste it or anything so no worries. 6) Spot treatment for dryness. Whenever I have a blemish I use a spot acne treatment. My skin dries out really bad from the medication in the cream. I use Vaseline on the one spot to fix dryness quickly. I would recommend putting it on your entire face but as a spot treatment it works like a charm!